the powerful energies coming onto the planet. Are you ready for deep and profound change? 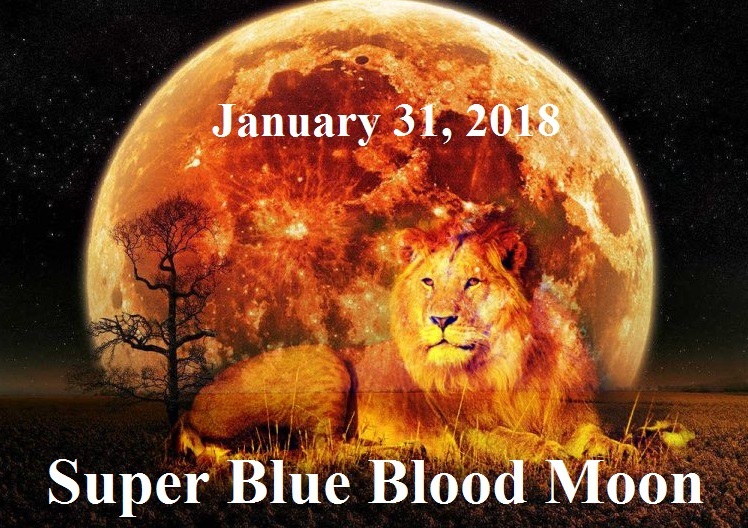 On January 31, 2018 we have a very rare and powerful Full Moon. This is also a Blue Moon (second full moon in a calendar month). AND a full Lunar Eclipse known as a Blood Moon. call to support you on your journey. This call will be about 75 minutes in length. DaKara always over delivers, so plan for 90 minutes. energy healing processes and a magical meditation. Lunar eclipses block the past allowing us to focus on the present moment. views of certain energies, emotions and aspects. about life. Aquarius gives us opportunity to review life from a higher perspective. What new higher vision is there waiting for you to observe. you back from truly embracing your true self. behind, bringing you back into wholeness. and teaches you about how to be more loving and kind. energies and focused with pure intent. lay out a plan for 2018 and so much more! Oh my goodness! It totally dropped to zero and I felt amazing energy pulsing and vibrating through me during the meditation and tears burst forth unexpectedly. I felt really cleansed afterward, fresh and alive. I Had a meeting two hours afterward that I had been afraid of attending but felt fine at, after doing the healing work this morning and then later a journalist called to ask me to speak publicly about an issue going on here with the govt trying to close down an Urban farm school so they can sell off the land which is worth a fortune. I had no problem saying yes to the request and will be doing it tomorrow morning! I feel now that we’ve uncovered the most hidden gatekeeper I had since I started attending your calls in November 2017. Great stuff, you do amazing work. We are having a lunar eclipse pool party this evening with a couple of other families as the viewing will be spectacular here in Perth as it’s summer! The kids will love it. hi Sam… that is amazing! keep up the good work for your area and the planet!